Tucson, Arizona – In an effort to actively engage families in the great outdoors, leaders of Safari Club International Foundation (SCIF) and Quail Unlimited (QU) announced that they will be hosting the first annual EPIC Outdoor Game Fair. The event will be held September 23-25, 2011 in Douglasville, Georgia at the Foxhall Resort and Sporting Club. Modeled after European game fairs, EPIC Outdoor Game Fair will provide hands-on activities bringing outdoor sporting Education, Participation, Instruction and Competition to families, youth and individual enthusiasts – hence, the name EPIC Outdoor Game Fair. EPIC Outdoor Game Fair will feature numerous hands-on opportunities as well as seminars from the industry’s most recognized experts. Foxhall’s 1,100 acres along the Chattahoochee River will be transformed into “villages” featuring shooting, archery, fishing and fly fishing, boating and kayaking, equestrian, dog training, ATV use and more. Vendors from each of these outdoor recreational interests will represent the finest manufacturers in the world, including many fine gun exhibits, and outstanding food and beverage options throughout the three-day event. Sponsorship and exhibiting opportunities are still available. “I would like to thank the following sponsors: Beretta, Eukanuba, Laser SHOT, Shooting Sportsman Magazine, and John Rigby & Co. Gunmakers, Inc. for their commitment to partner with QU and SCIF in our inaugural year of the EPIC Game Fair,” concluded Cam Harris, Chairman of QU. Safari Club International Foundation (SCIF) is a 501(c)(3) charitable organization that funds and manages worldwide programs dedicated to wildlife conservation, outdoor education, and humanitarian services. Since 2000, SCIF has provided $47 million to these causes around the. Visit http://www.safariclubfoundation.org for more. Quail Unlimited® is the oldest national, nonprofit conservation organization dedicated to the management of America’s wild quail. Known as “America’s Leader In Quail Conservation SM,” our overall vision is to restore America’s quail populations for future generations. Our core values include the wise stewardship of our land and its resources, and the continuation of our proud heritage of conservation, therefore, leaving a legacy and firm foundation for our youth and families to build upon. The Annual Hunter’s Convention held by Safari Club International is a magnet for power players in big game hunting, but this year marked a departure as leaders in upland shooting announced significant developments with far-reaching implications. Quail Unlimited is teaming up with the SCI Foundation to stage an American outdoor game fair intended to rival the sprawling extravaganzas in the UK. Billed as the Southeast’s largest game fair, it’s scheduled for September 23-25 at the Foxhall Resort and Sporting Club in Douglassville, Georgia – a section of the US with a distinct heritage of plantation upland shooting. The Reno-Sparks Convention Center in Reno, Nevada also saw news from the Beretta Trident Program during the show’s run of January 26-29. Launched in May 2010 with four charter destinations, the Beretta Trident Program had unveiled a scrupulous quality rating-system for hunting, shooting and clays venues designed to ensure an unblemished experience for sportsmen. During the SCI Annual Hunter’s Convention, the Beretta Trident Program revealed its first international presence for wingshooters, as well as additional “Tridents” for their inaugural members. At the SCI Convention, shotgun luminaries such as Zoli President, Paolo Zoli, were talking with enthusiasts about their firearms like this Zoli shotgun. This year marked the 39th Annual Hunter’s Convention, and if you have never attended the conference the array of quality shotguns among 1,100 exhibitors sprawled across 650,000 square feet is alone worth the price of admission. Unlike the massive Shot Show, which is reserved for industry professionals, the SCI Annual Hunter’s Convention is open to all enthusiasts. Shotgun lovers get to handle fine firearms and chat up executives they may normally never meet. Alex Diehl, Krieghoff’s General Manager, is always friendly and obliging. Guy Bignell, the CEO of Griffin & Howe, was ever-present in their display. Purdey’s CEO, Nigel Beaumont, approached people admiring his guns. The legendary Tony Galazan of Connecticut Shotgun would answer questions and talk about his impressive inventory of firearms. Norbert Hausmann, CEO of Blaser, spent a lot of time in the company’s exhibit. Paulo Zoli was extremely helpful when it came to his eponymous shotguns and rifles. Cav. Ugo Gussalli Beretta was available in the Beretta retail store and gun exhibit. And restoration mastermind Doug Turnbull of Turnbull Manufacturing Company was happy to share his expertise. 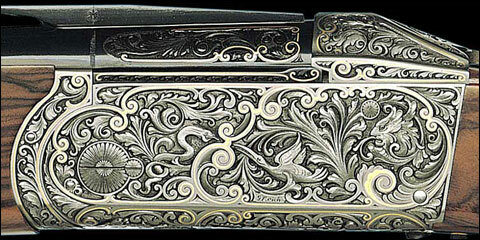 Krieghoff showcased its best shotguns at the SCI Convention, similar to this exhibition-grade K-80. In addition to meeting the men and women of shotgun royalty, the SCI Annual Hunter’s Convention laid before you the most gorgeous and rarified shotguns on the planet. Boss & Co., Hartmann & Weiss, Holland & Holland, Fanzoj’s remarkable tri-bore drilling shotguns, the breathtaking George Hoenig Rotary Round Action shotgun, Holloway & Naughton, Peter Hofer, G.S. Pedretti, Verney-Carron and Westley Richards came together in a singular experience of shotgun Nirvana. Of course, the SCI Annual Hunter’s Convention was equally as impressive for rifles that occupied the same six-figure stratosphere as the bespoke shotguns available on the show floor. The fascinating three-barrel drilling gun by Fanzoj of Austria. Still, amid the dazzling display of shotgun artistry, the biggest developments in upland wingshooting came from Quail Unlimited, the SCI Foundation and the Beretta Trident Program. EPIC Outdoor Game Fair. Both groups are 501(c)(3) charitable organizations. The proceeds from the fair will help underwrite their ongoing programs to defend and promote America’s outdoor heritage. In the spirit of their UK predecessors, the organizations intend for the EPIC Outdoor Game Fair to capture the universe of hunting and fishing, but in the cradle of Southern plantation hunting. The EPIC Outdoor Game Fair is slated to be held on 1,100 acres along the Chattahoochee River under management by the Foxhall Resort and Sporting Club. The setting is about 20 minutes from Atlanta’s Hartsfield-Jackson International Airport. The organizers are expecting about 29,000 adults and legions of families. For destinations in the Beretta Trident Program, Three Tridents are the pinnacle of performance. At the SCI Convention, four of the participating venues were awarded their second Trident. On top of the EPIC Outdoor Game Fair, news of expansion and accolades came from a press conference in the midst of the hustle and bustle of the Beretta exhibits. 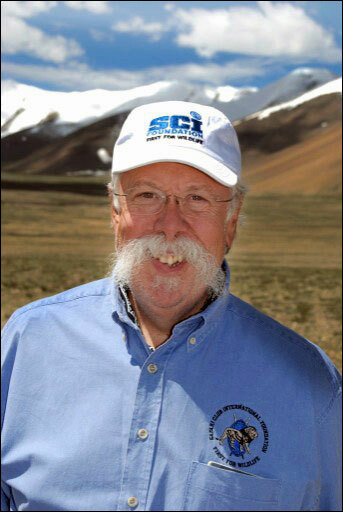 Jonathan Sherrill, President of the Sporting Heritage Corp., which oversees the Beretta Trident Program, named their first two international affiliates. The Sierra Brava Lodge and its sister operation, Estancia Los Chanares, are both in Cordoba, Argentina – providing the Beretta Trident Program entrée into the country’s celebrated high-volume dove shooting. Each was awarded one Trident for upland birds. The first-generation of Beretta Trident Program venues advanced from their initial One Trident up to Two Tridents. Three Tridents are the pinnacle of excellence. Upland shooting at Joshua Creek Ranch. Less than five percent of such operations worldwide merit even One Trident. The Two Trident destinations are now Joshua Creek Ranch in Texas, the Cheyenne Ridge Signature Lodge in South Dakota, the Highland Hills Ranch in Oregon and the Pine Hill Plantation in Georgia. “These affiliates represent the best of the best for upland bird hunting destinations and have earned the distinction of a Two Trident rating by making even better the hunting and overall guest experience,” said Dennis Doyle, Vice President of Operations for the Sporting Heritage Corp. The Beretta Trident Program was itself recipient of the Award of Excellence for Shooting Sports by Sporting Classics magazine. The honor came in recognition of the Beretta Trident Program’s groundbreaking efforts in providing sportsmen and women with an objective rating system for hunting and shooting sports venues. Irwin Greenstein the Publisher of Shotgun Life. You can reach him at letters@shotgunlife.com. The 25th Annual Quail Unlimited Celebrity Conservation Hunt once again brought dozens of actors, musicians, and athletes to South Georgia. Hundreds of other people are in locale to track with those celebrities. For a entertain century the eventuality has expansion the word about cower sport in the Albany area… assisting it blossom in to a multi-million dollar industry. Quail Unlimited is relocating its national domicile to Albany. It’s more explanation that South Georgia a of the tip bird sport destinations in the world. Economic experts are assured that type of promotion will make help the traveller attention here grow. Former Brave Ryan Klesko and other Celebrity Hunt guest suffer a day of cower sport at icy Southern Woods plantation. Lifetime friendships are frequently fostered in these hunts. “A great crowd rise, or only a singular bird forthcoming up in the hunger trees. Look there, that dog’s indicating guys. We got a indicate correct here…” Klesko said. “This is the cower capitol of the world, period, ” saidSam Klement. Joe Hosmer of Texas wanted with his aged English side close shotgun, done in the late 1800′s. One of the leaders with Safari Club International Foundation, Hosmer says South Georgia’s picture is golden. “We are entangled with sport all over the world, and South Georgia, the camp belt, is well known to us and all the great wing shooters around the world as the place to go for quail,” Hosmer said. Now with Quail Unlimited’s national domicile relocating to Albany, the sport industry’s repercussions is approaching to follow. “It will grow. With this association, with these other people that you are getting entangled with,” saidQU Board of Directors associate Gene Hartman. And after getting to know South Georgia, a few of these on vacation hunters, similar to actress Patrick Kilpatrick, confirm to do business here. “In fact you have two cinema my prolongation company, that you hope to bring to Georgia. I admire it down here,” Kilpatrick said. More promotion going out about South Georgia cower hunting, assisting the multi million dollar attention to blossom even larger. Quail Unlimited scarcely went broke during the mercantile collision two years ago, but right away with their pierce to Albany, business experts feel the group is well on it’s way to recovery, and South Georgia’s sport attention will gain with MORE jobs and mercantile growth. The superstar hunters will grip an auction tonight at Darton College sponsored by Winchester, and then other day of sport is to celebrities tomorrow. The Covey Finale cooking eventuality takes place Saturday night at 7:30 at Darton’s Sports Complex. It’s sponsored by Budweiser. There aresix species, and the Bobwhite Quail is the many familiar in the United States. They obtain their name from the familiar “Bob-Bob-White” call males use to capture hens. Bobwhites are belligerent home birds and feed primarily on insects. They can fly partial distances at 20 to 40 miles per hour. During the fall, the birds form in to amicable groups called coveys. This helps them prevent predators. The life camber of a Bobwhite Quail is reduction than a year.